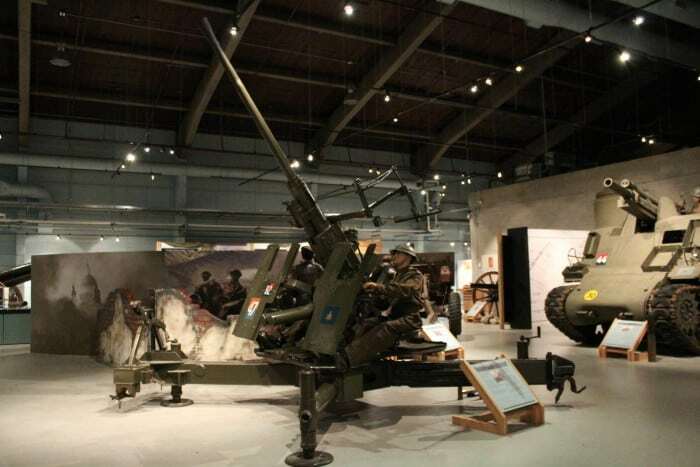 The 40mm Bofors Light Anti-Aircraft (40mm LAA) gun is a Swedish design that was in Canadian service 1941-1959. The 40mm LAA replaced obsolete guns remaining from the First World War pressed into service 1939-41. Two-thirds of the LAA in the 1st Canadian Army were composed of 40mm LAA in the towed variant on display here or the truck mounted self-propelled variant. The towed variant of the 40mm LAA also formed half of the air defences in Canada 1941-45. The 40mm LAA remained in service as defence against Soviet bombers until 1959. A number of guns removed from the HMCS Bonaventure were put back into Artillery service to defend Canadian airfields in Germany 1970-1987. DETACHMENT: Gun and towing vehicle or gun mounted on truck bed (self-propelled variant) and 7 Gunners.